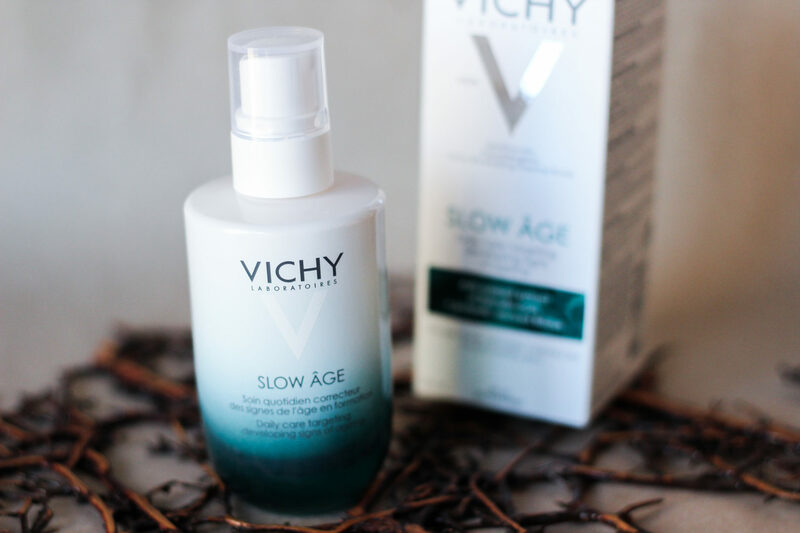 Vichy has recently unveiled its new range Slow Âge for natural anti-aging care. For myself, I chose the fluid designed for ladies who lead a fast-paced way of life. The fluid prevents the appearance of wrinkles as a result of daily stress, fatigue, exposure to harmful sunlight and bad habits. Slow Âge helps the skin to lead a more relaxed life, preserves its balance and keeps it protected from external factors. The range Slow Âge contains three main anti-aging ingredients – extract from Baicalin root antioxidant, Bifidus probiotic derivative, and Vichy thermal water. All day care products have sun protection properties, the fluid I tested has SPF25, whereas the cream, which has richer texture, has an SPF of 30. Slow Âge is designed for women aged 25 years to 45 years. The fluid is for all skin types while the cream is suitable for dry to normal skin. My initial impressions are very positive – the fluid hydrates and protects against harmful sun rays, it smoothes and evens out the skin, and despite its high sun protection factor, it does not make the skin oily and heavy. I will definitely use it a lot this summer!